Website design is not usually in a small business owner’s wheelhouse. You might be skilled at customer service, making sales, and marketing. There are some things though, that you should probably hire a professional to do. But, chances are when you’re getting started, you DIY as much as you can, including your website, instead of paying a professional. 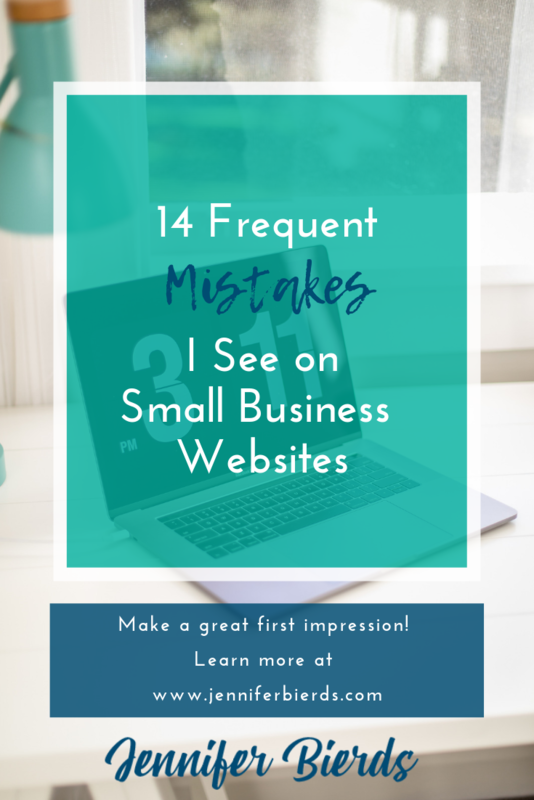 There are several ways you can get a low- or no-cost website, and some options are better than others. Squarespace, for example, has great templates where you can realistically drag and drop your own images and content and have a pretty decent website. However, there are some things that are a dead giveaway that your site is not professionally designed, no matter how great the template. Too many items in the navigation - Studies show that people are more likely to move forward with making a decision if they’re given less options. So, if you’re navigation has links to 10 different pages, visitors may potentially be overwhelmed and not no which one to click. In that case, they may just leave your website in search of a business where they can easily find what they want. Too much continuous text - Life these days is fast-paced, and we want what we want sooner rather than later. That being said, if you have a small novel on your webpage, people aren’t likely to take the time to read it. You’re better off with bullet points highlighting the important points, or at least, breaking up that excessively long paragraph in to more than one. No/wrong email address - Another part of our current culture is that people would rather send a message electronically instead of pick up the phone and talk to a person. Though a Contact Us form is better than nothing, having an email address on your site as well is not a bad idea. Oh, and make sure that it’s the correct one. Inconsistent color scheme - If you’re like me, you love color, and it’s fun to play around and add different accents throughout your site. But, sometimes you have to reign that in, and on your website is one of those times. Your website should have a definite color palette that flows from page to page. Poor image quality - Your images can really make or break your website. A so-so website with great photos is better than a good website with bad ones. If you have blurry images with poor lighting, that can hurt your visitors’ perceptions of your brand. Make the effort to have great pictures, whether you learn to take good ones yourself, hire a photographer, or pay for high quality stock images. No way to place orders/requests - I have seen soooo many bakeries’ websites that say, “Call us now to place an order!” What happens if someone finds you at 7pm on a Sunday? Do you just hope that they’ll remember to call you tomorrow morning? Offering your customers the ability to place orders, or at minimum requests, on your website can save you from a lot of missed sales opportunities. Too many fonts - Just like colors, fonts can be fun to play around with, but having too many on your site is an amateur move. A website should have two, maybe three, complementary fonts. 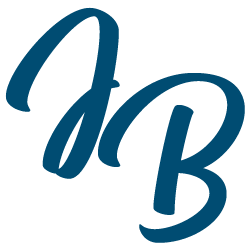 No favicon - Another amatuer move - not having a favicon for your website. The favicon is the tiny little icon on the browser tab. If you still have that Squarespace cube, that’s a clear sign you do not have a professional website. Disorganized information - This one is detrimental to your users’ experience. If you have all kinds of info on one page, from your menu, to the latest events, to the story of your shop, people aren’t going to know where to find what they need. When they can’t easily find it, they’ll just leave and find it elsewhere. No call to action above the fold - If there’s no indication of what you want visitors to do on your site, they might click around, or they might not stay on your site at all. Think about what is most important to your small business right now, and promote that at the top of your site where no one has to scroll down to see it. Site is not secure - This one’s a biggie. We’re all freaked out nowadays with being hacked or taken advantage of online in some way. Your website should be secure. Period. You can add an SSL certificate, or, if you have a Squarespace website, it’s included with the business plan. A generic email address - susiesbakery@yahoo.com doesn’t look nearly as professional as susie@susiesbakery.com. Pay the extra money to upgrade to a custom email address, and show people you mean business. If you’re not willing to put more money into your business, why should any of your customers? Broken links - It’s hard to always stay on top of this, because let’s face it, stuff happens. 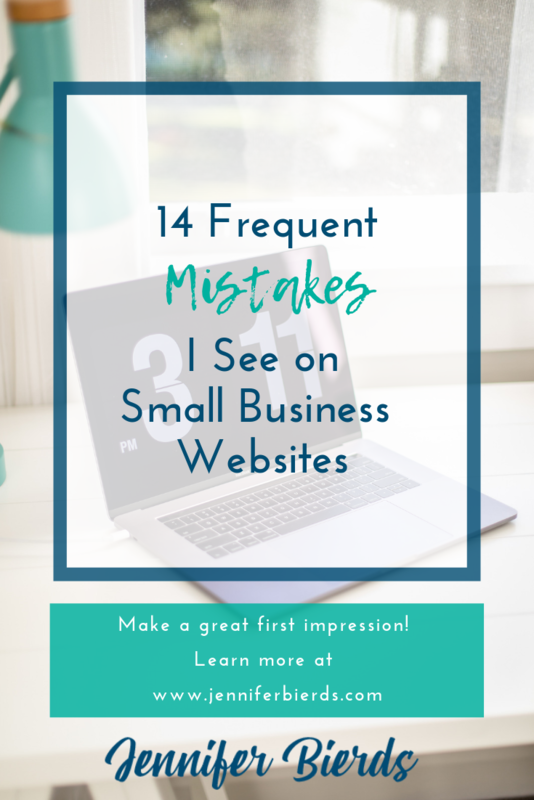 But, taking the time to periodically check your links - buttons and text - and make sure they’re working will keep your site from giving a bad impression. No one wants to click on your site and be taken to an error page. When you’re a small business owner just getting your business off the ground, you’ve got a lot on your plate. Just make sure that if you choose to design your own site, you avoid the mistakes I listed above, and you’ll be ahead of the game. If this seems like a lot to take into account, it is. So, if you’re considering hiring a professional instead, let’s talk! I’ve got two packages to offer for custom Squarespace design, and either way, I know you’ll be happy with the end result. Sign up for your free consultation call now, or click through to my portfolio below to see what’s possible!